display at the Museun of Prehistoric Thira). Ancient Akrotiri is located along the shores of the caldera on the southern part of the island. It is open June to October from Tuesday through Sunday from 8 a.m. to 8 p.m. and admission is about €10 EUR (about $12 USD) per person. You can get to the site via car or bus. This fascinating archaeological site was first discovered in the late 1960s but its buildings date back to the 16th century B.C. 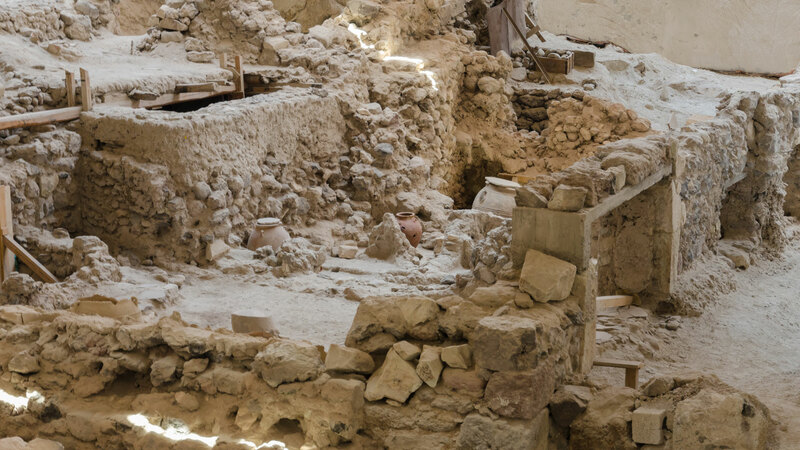 This former Minoan outpost was destroyed by a volcanic eruption, but thanks to years of excavation enough of the site has been uncovered to allow visitors to explore. Most visitors are impressed with how this site is still intact: "The village is incredibly well preserved. It is rare to see such history in this way," said one Trip Advisor user. While you're here, you'll see former homes decorated with prehistoric frescoes and littered with pottery (however, much of Akrotiri's findings are now on display at the Museun of Prehistoric Thira). Ancient Akrotiri is located along the shores of the caldera on the southern part of the island. It is open June to October from Tuesday through Sunday from 8 a.m. to 8 p.m. and admission is about €5 EUR (about $7 USD) per person. You can get to the site via car or bus. 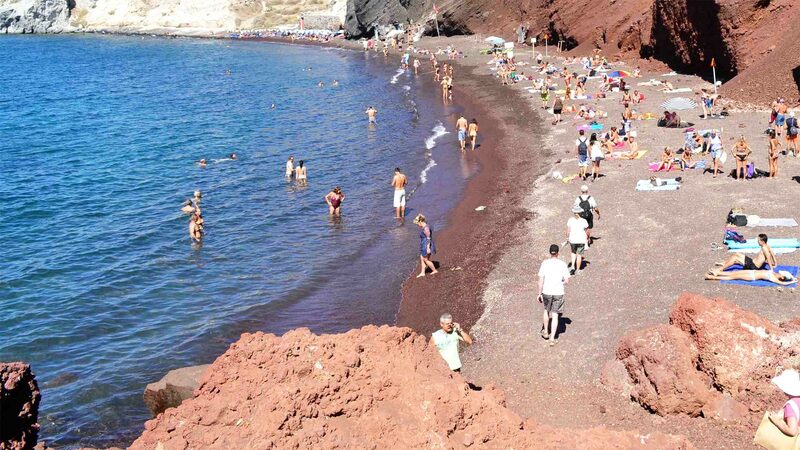 At the tail end of the road to Ancient Akrotiri, this beach earned its name from its reddish volcanic sand. 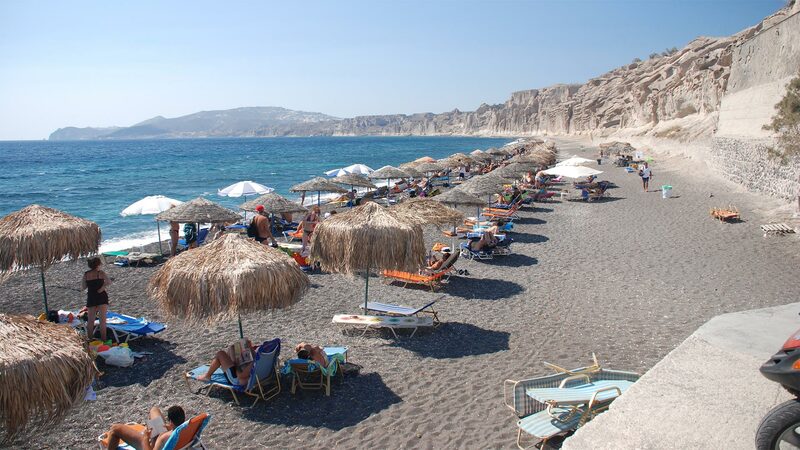 Like Santorini's other beaches, this red sandy strip comes with all the trimmings (beachside cafes and tavernas); however, it is much less crowded than the more famous black-sand Kamari Beach. Travelers say the scenery is stunning — be sure to bring a camera to take photos of the stark contrast between the brick red cliffs and the aquamarine water. Although the Red Beach is a great swimming spot, some report it can be difficult to get there. 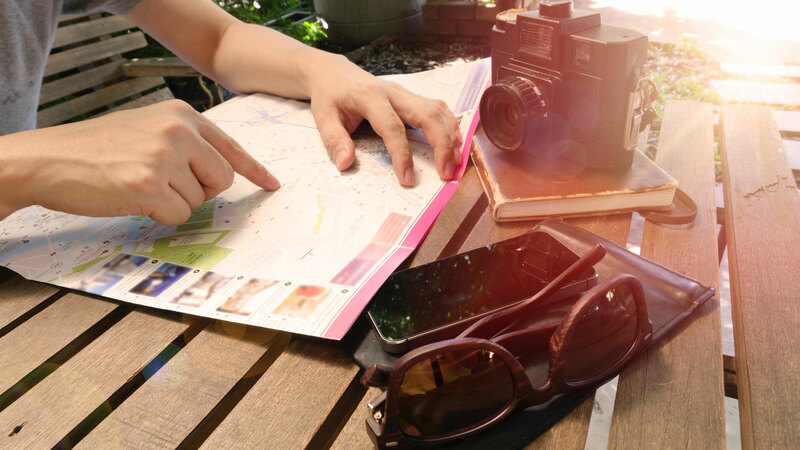 While its remote location means that you'll have a better chance at claiming some prime beach real estate, if you're not up for a hike, you may prefer to sun elsewhere. You'll find the Red Beach just south of Akrotiri and you can get there on foot, via bus or by car. 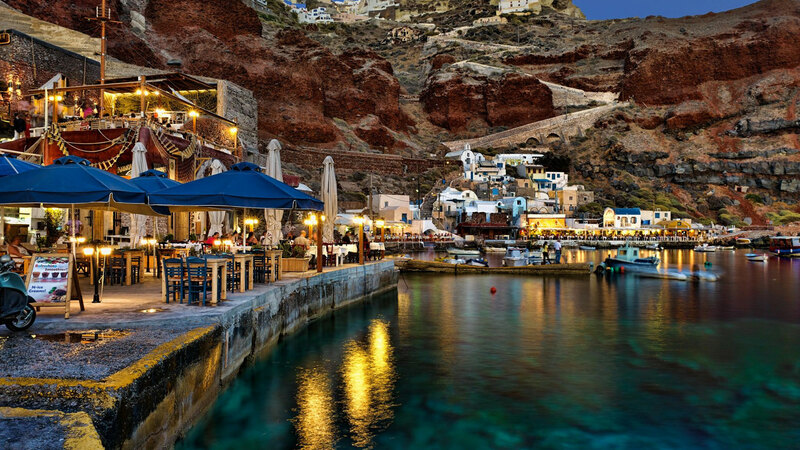 For beautiful views of the caldera, descend the 300 steps from the northern city of Oia to the tiny port of Amoudi Bay. (Travelers say the hike can be taxing but it's well worth it.) 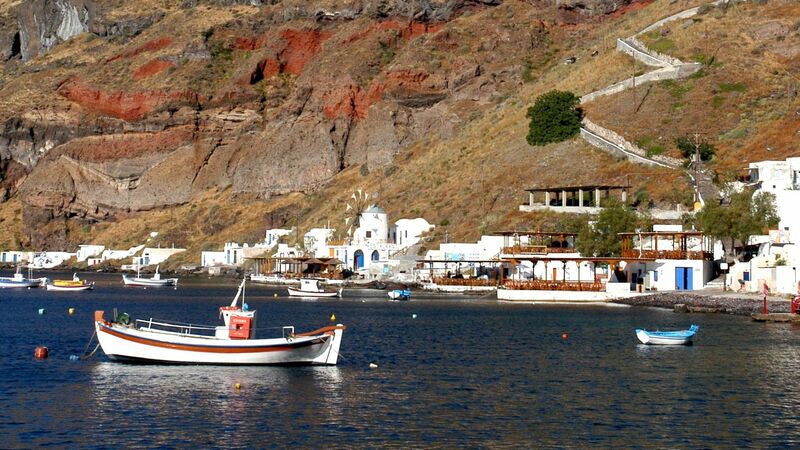 Surrounded by steep cliffs, this little fishing area features several quaint tavernas serving up the catch of the day. This is also a nice spot to enjoy the sun and some swimming, though the beach is rocky so you should bring appropriate footwear. 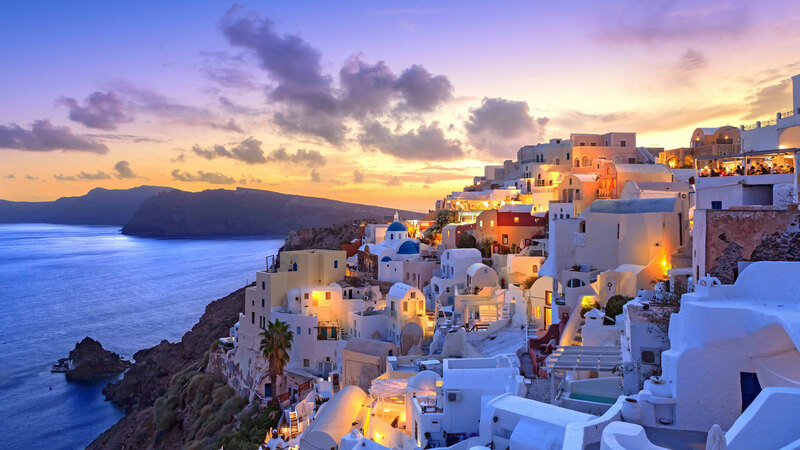 And according to recent visitors, Amoudi Bay is a great place to catch a Santorini sunset. "Definitely worth dropping in to see thesunset and enjoy an evening meal, or alternatively for lunch," suggested one TripAdvisor user. You can reach Amoudi Bay on foot or by car, thouogh you may have to park a little ways up from the beach. Access to the area is free and nearby restaurants vary in price. The island of Santorini has a long history in viniculture, with the indigenous white Assyrtiko grape being the dominant variety. Wine production on the island dates back to Roman times, but particularly flourished under Venetian control during the Middle Ages. 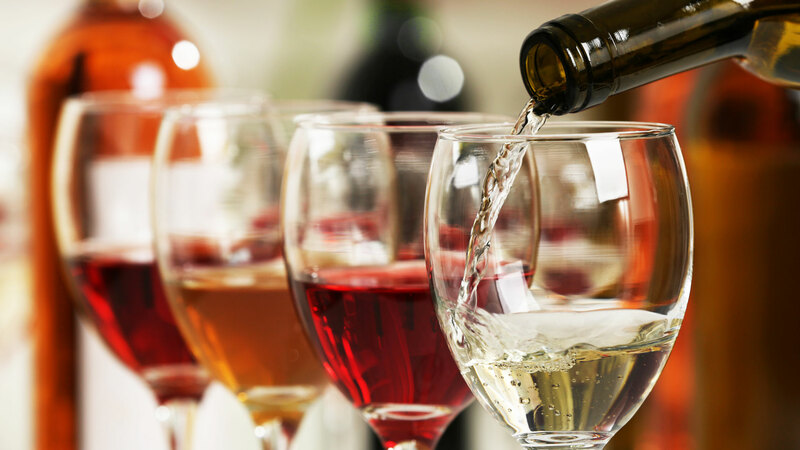 Visitors have plenty of dry whites, roses and reds to sample at the island’s best wineries. We suggest Sigalas and Gaia Wineries, Argyros Estate for their clean, comfortable facilities and good selection of wines. There is also available wine tours where you can visiti 4 or 5 different wineries and have wine tasting in a few hours. 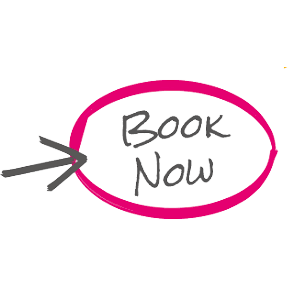 (You can always ask from us more informations). Santorini’s unique landscape is best appreciated from the water. Split the cost with your travel buddies and hit the waves on a luxury catamaran or traditional boat. A sailing tour will reveal multihued rock formations, stunning private beaches, and incredible views of the whitewashed towns perched high on the caldera. Stop for a swimming break and enjoy the plentiful seafood lunch prepared by the crew. 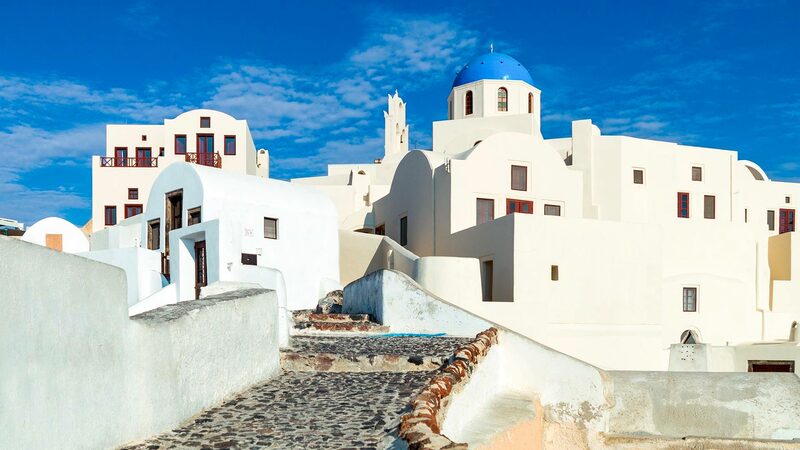 This all-inclusive experience is the ultimate way to experience Santorini! 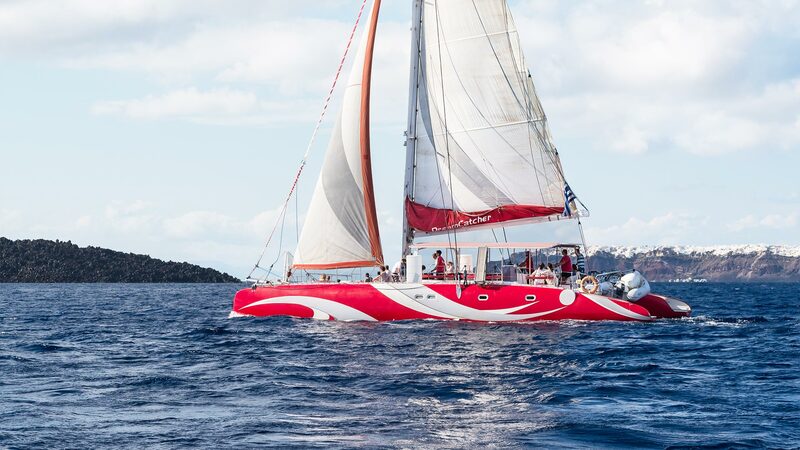 There are a lot of sailing companies on the island, if you re interesting we can give you more information and prices. 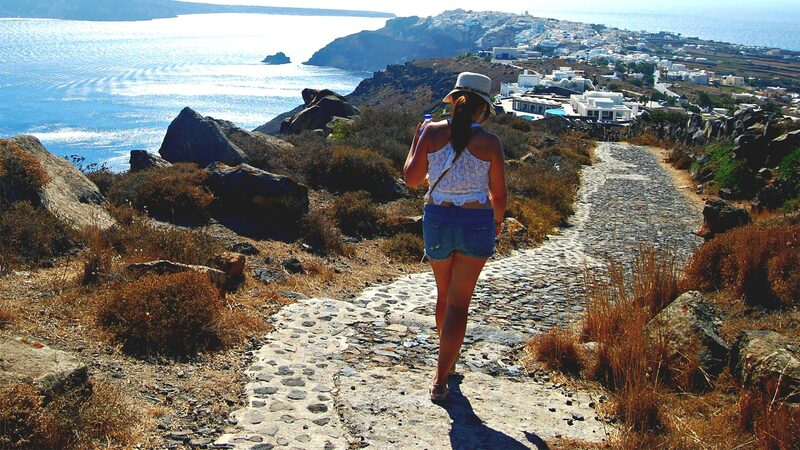 Don’t miss to walk the path from Fira to Oia! Waliking guided tours are available on request for travelers who love exploring, enjoy walking, and adore experiencing the local way. 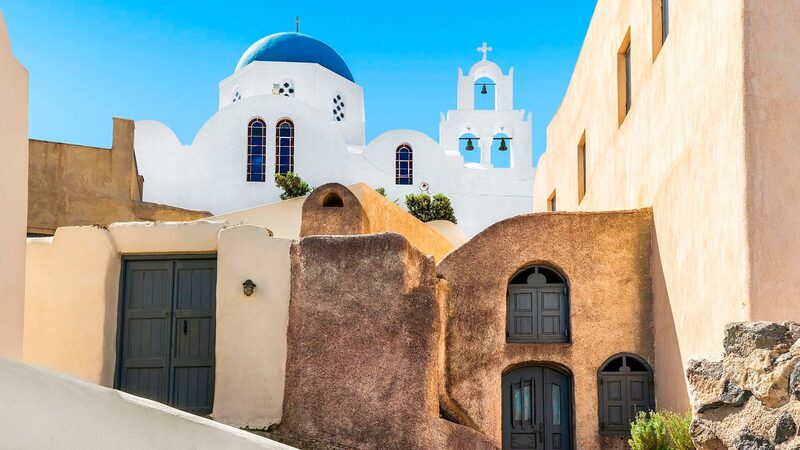 Visit the secret spots of Santorini away from the hustle and bustle, walking through ancient paths and picturesque cobblestone alleys. Marvel at the famous caldera, explore whitewashed villages forgotten by time, and take in the amazing scenery in a responsible and eco friendly way. Located in Southern Santorini, Vlychada beach is probably the best beach in Santorini, Greece. The picturesque Marina with the elegant yachts , the busy port with the local fisherman and the alluring taverns, with the smells of local delicacies, make Vlychada beach, a favorite amongst those who visit Santorini, Greece. Southern Santorini has a wild beauty with the dynamic rock formations and the ambience of Ancient Thira. Megalochori (or Megalohori, Megaloxori, meaning big village in Greek) is the first village we meet if we arrive at Santorini by boat, after climbing Athinios port caldera. It is located between Pyrgos, Emporio and Akrotiri at a distance of less than 10 km from Fira. It is made of hundreds of small white painted houses built the one upon the other and it is characterised by its beautiful churches. It combines traditional architecture with vaulted houses and calderimia (stone-cobbled narrow pathways) and a lively community with a fairly large permanent population. Megalochori is the center of the wine industry of Santorini and it is surrounded by vine yards. Megalochori attracts a fair number of tourist, choose it as a handy base for exploring the island: it is not far away from Fira, and within easy distance of Akrotiri and the beaches of Perissa, Perivolos, Agios Georgios and Vlihada of the South coast. Emporio is the biggest village built on the centre of the plain in the South part of Santorini. 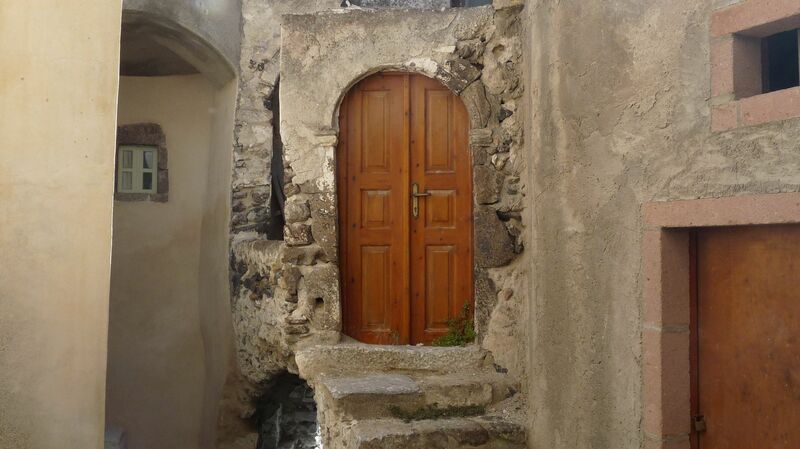 The old village part is built with small picturesque streets that add to the village's beauty. Emporio also had a fortified castle during the medieval years built by the Venetians called Casteli, vestiges of which are still visible. North of the village there is a strong, square building named Goulas, in which the village people protected themselves from the pirates. One of the oldest church on the island, Palia Panagia which is famous for the ornately carved wooden dome on its bell-tower, extracts the attention of every visitor. It's a quaintness village with several shops and a few taverns-restaurants. Pyrgos was built on the top of a hill and was until the early 1800, the capital of the island. The village is composed of traditional houses built around the Venetian Castle and the small streets follow the shape of the hill. Climing from the square up to the castle of Pyrgos, the stone houses crowd more densely together and the labyrinth of narrow vaulted lanes becomes more tortuous. The village has many churches, around 33, but the most famous is the Monastery of Profitis Ilias, where a small collection of ethnographic material and old icons are exhibits. Pyrgos is a lovely place, winter and summer alike. Although it is one of the prettiest places of the island, Pyrgos has only recently won a place on the tourist map. It has become known largely because of the splendid Easter celebrations instituted a few years ago by its deputy mayor. The day before the Plam Sunday, the whole place is fragrant with the scent of the rosemary that decorates the 17 metre cross. The whole island turns out the procession of the Epitaphios on Good Friday when the village decked with tin lanterns so that glows like a jewel in the night. Pyrgos is a place that certainly worth a visit and dedicate enough time to the most fabulous panoramic view of the island. We can recommend you some tours from the old port or Ammoudi bay. Thirassia, off Santorini near Ia, is the largest of a chain of islets that remain from the ancient Strogili (before the volcanic activity) and the only one inhabited. Its main village, Horio or Manolas, is a pretty place with whitewashed houses, reached by a flight of 250 steps from the landing-place. In the summer months the travel agencies of Santorini run trips from Fira and Athinios to the volcano and hot springs that include Thirassia. There are a few rooms to rent on the island. The best part of Thirassia is that it provides a look into the past on how Santorini was before tourists discovered the island. We suggest you to include Thirassia in your itenerary!